During the night he saw in a dream masks that the Koniags [Sugpiat] afterwards used as if they were alive, and heard songs sung by some unknown voice. As soon as he awoke he began to sing these songs and went hunting and killed a great many animals. This cedar wood mask may be from Prince William Sound; it portrays a singing spirit face with nose and brows in the shape of a whale’s tail. Separate eye pieces were once attached but now are missing. Whaling – carried out by kayak hunters using poisoned darts – was surrounded by shamanic ritual. Andrew Abyo: In the Sugpiaq culture we would, actually, if we wanted to memorialize someone, or to pray for good hunts, or pray for good whale hunts, we would make a mask. Carve the mask, then we’d compose a song and compose a dance for like the memorial, right? So, we would actually dance the mask. And, immediately after we danced the mask, and while we would dance the mask — whoever was here you would also put your prayers and messages to your loved ones, right? Or if it’s for good hunts. And so, while we’re dancing the mask, immediately after we danced the mask, we would burn the mask, right? And in doing so, the flame, the smoke brings our messages to our loved ones, or prayers for good whale hunts, or for animals to return in the spring. So yeah, as beautiful and elaborate as the mask was, they would burn it . . . and as a result of this kind of tradition, not too many Sugpiaq masks have survived. So, that’s why there’s not too many Sugpiaq masks in collections, even around the world. But, we do have some masks, and I think they are here for us to learn from today. Audience: You mentioned this is yellow cedar. What other woods were used in the past? Andrew Abyo: Yellow cedar, spruce, red cedar could be used, — let’s see what else is there — willow, alder, but alder more comes from the Southeast side [of Alaska]. I have never gotten to work with alder, have you Aron? Some people who work with alder to make masks say that when it’s green, they say it just carves like butter. Yellow cedar is really easy to work with, also. Yeah. . . . Dawn Biddison: What kind of tools would a mask maker have used back then? Andrew Abyo: Let’s see, some tools that were used were like clamshells, clamshells can be used as carving tools, very sharp of course and can you imagine a beaver’s tooth? Dawn Biddison: Is that for finely carving parts? Andrew Abyo: And they can make the tooth blade even smaller by splitting it. . . . Dawn Biddison: And the wood that was used for this mask would that be something that they obtained from driftwood or trade or? 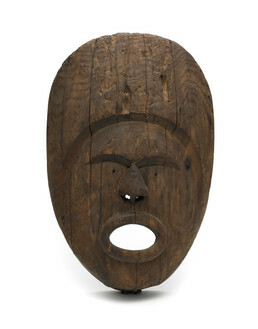 Andrew Abyo: Depending on if it’s from the Aleutians Islands and the Unangax^ people, but this is a Sugpiaq mask, the Sugpiaq, there were some places where there were no trees. And so they used everything from driftwood, including masks, kayaks, visors, even the housing structures was all driftwood. Yeah let’s see. But there are some regions where the Sugpiaq people have access to trees. Andrew Abyo: Some kind of paints that were used for brown, you can use octopus ink, right. For black we’ll use the char from the fire. Let’s see, for yellow we could use, like dry yellow grass, just boil it, and then that will give you yellow tinge. Monica Shah: Would you have to put it in anything? Andrew Abyo: Actually, seal oil or blood was used because it is a coagulant to make it stick. Monica Shah: And so, with yellow grass do you add a ground stone or ground earth or something in addition to the liquidy part? Andrew Abyo: Yeah, you would have to add as a thickener. Andrew Abyo: And of course ochre, which is like a type of rock, pound in. Let’s see for blue they could use the gall bladder of a duck, which is actually blue. Audience: Is there a specific significance or was there a particular bird or species that would be used over another? Andrew Abyo: Yeah, well I’m not sure about the significance of one being used more than another. Duck feathers were used, eagle feathers. I think eagle feathers were very valued and used . . . and this would give effect when it’s being danced. [From the Smithsonian Spotlight public talk and individual discussion with Andrew Abyo hosted by the Arctic Studies Center at the Anchorage museum on 10/06/2011. Also participating: Aron Crowell, Dawn Biddison and Monica Shah (director of Collections, Anchorage museum)]. Sven Haakanson, Sr.: If you could find some of them [masks], a lot of people knew where there were caves [with masks]. I think Costia Inga and some other people. But they reburied them, because they didn’t want people to bother their ancestors. And they still look for all those masks. They had masks for different occasions – for weather, for fishing, for hunting – their ceremonies. . . . If someone was sick, they would take certain masks to ward off evil spirits and stuff like that, just the same. Laurie Mulcahy: And the elders or the shamans would use them? Sven Haakanson, Sr.: I guess the shaman would use them and shamans helpers. They’d have these dances in their huts before the hunt, and they told stories by singing. John Johnson: From talking to various people, I think a lot of these masks were used for various dance ceremonies. And then as the individual dies, these masks sometimes were placed with the dead when they passed away. And we find all different types of masks like that. Sergius Moonin: Masking started a long time ago, before the Russians came. Masking happens in the wintertime. . . . They used to mask in the wintertime for 12 days. Every evening they used to mask. They made masks out of boards and seal skins. There was music and drums. Every night they masked for 12 days, 12 nights, until 12 midnight. Then they quit. All their equipment would be placed away for next year. They would hide their masks. Everybody had a good time. There were no houses, only barabaras. (1) They danced in the barabaras. In one big barabara there was a lot of people. They dress up when they mask, so no one will recognize them. . . . It’s kept up here, and on the Aleutian chain. This Bishop said to keep it up. That it’s a souvenir from your great, great grandpa’s past. . . . Other Priests told me to quit masking. 1. A barabara is “semi-subterranean house constructed of wood and covered with an insulating layer of sod.” From Looking Both Ways, 2001.